The city’s police union has filed a labor complaint because officers are now required to carry a life-saving drug that’s not included in their contract. Members of the Stamford Police Department began carrying Narcan in July after the city experienced a spike in overdoses, including three in one day over the summer. 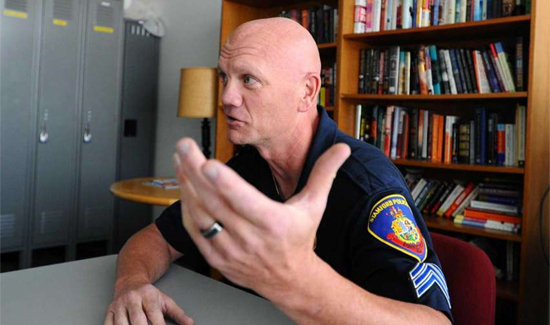 The unfair labor complaint was filed last week with the state Board of Labor Relations, but Police Union President Kris Engstrand said his members do not object to carrying Narcan. Stamford medics have been carrying the opioid antidote for more than three decades and city firefighters have been using it since 2015 after heroin deaths in Fairfield County jumped by more than 50 percent between 2012 and 2013. Stamford first responders administered a record 32 doses of Narcan in June. That’s more than triple the monthly average of around 10 times in 2015. A total of 79 Stamford police officers have begun carrying the syringe-looking device that can inject the antidote in a person’s nose to reverse the effects of heroin and other more powerful drugs such as Fentanyl. Narcan can also be used on first responders who are exposed to Fentanyl, which can cause an overdose by coming in contact with a person’s skin. The state office of the chief medical examiner said there were 917 accidental overdose deaths in 2016 — up from 495 in 2013. Of the deaths last year, 853 involved opioids. Stamford Assistant Police Chief James Matheny said carrying Narcan is a commonsense measure to increase safety for the public and members of his department. The police union filed a similar unfair labor practice complaint last year when the department began a program to implement body cameras.